Every day, consumers turn to the web to know, go, do, and buy—and in Canada in particular, to discover. These micro-moments are critical opportunities for your brand to win people over and influence their purchases and preferences. And we’ve got new data on what your brand can do to get chosen. At this point, it's fairly intuitive that when people need something or have a question, they go online. The bigger question now is understanding how people think and act in the moments they turn to the web. This is perhaps the greatest challenge and opportunity for Canadian marketers today. 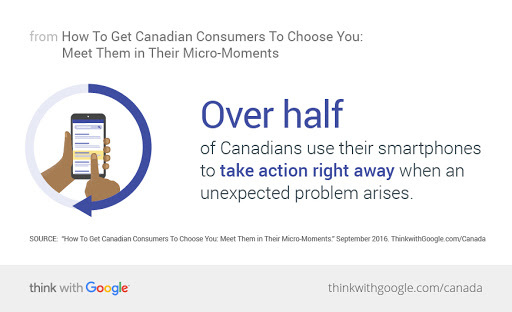 On any given day, Canadian consumers have multiple intent-rich micro-moments. If you can anticipate and deliver on what consumers need in these moments, your brand will have endless opportunities to connect. And we've got hot-off-the-presses research to help you do just that. Canadian consumers turn to the web in many moments before they're ready to buy. Just recently, I was on the hunt for a new car. I had planned on buying the same model as my old car (old habits die hard! ), but I did some research to see what other crossover SUVs might be in my price range. I wasn't conducting searches for particular brands or models, but instead searching for things like "latest crossover SUV features" and "safest crossover SUVs." So after I had my list of the safest cars on the road, that triggered more searches, including checking out safety features in action on YouTube, reading reviews from other buyers and blogs, and looking at what paint colors can withstand a snowy Toronto winter. Think about the first, second, third, or twelfth search someone like me might conduct when researching a new product. Because consumers are on the hunt for all kinds of information, it's important brands are present for standard branded search terms—and also for category and affinity search terms. When you can get in front of consumers with helpful, relevant answers that are easy to find, you can create goodwill and positive perceptions for your brand. Sometimes consumers know exactly what they need, and sometimes they're looking for ideas. My sister just had a baby and wanted some help putting together a nursery that would be the envy of all nurseries. We had some general ideas for what we wanted (she was pushing for a whale theme), but really what we needed were ideas and inspiration. We searched all over the web for ideas on color palettes, decorations, toys, furniture, what's best for the baby—and insight on how it to pull it all together. In these I-want-to-discover moments, people are at the early stages of thinking about what it is they need to buy and they're looking for ideas and inspiration. This is a prime opportunity to step in and bring your brand and products into the consideration set. Take a spin through Google Trends to see what kinds of things are in fashion in your category. 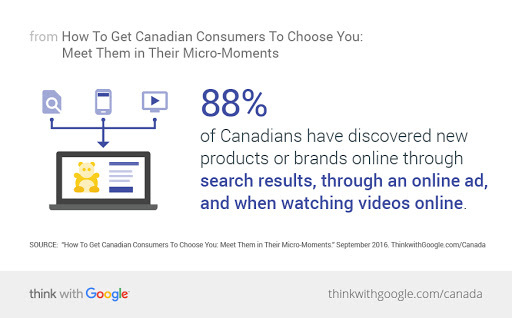 When you can get a read on what Canadians care about, what they might be searching for, and where they spend their time, you can create content that gives them just the "aha" moment they're looking for. Instead of calling my mom to figure out why my chocolate cookies aren't turning out quite right, now I whip out my smartphone and search "how to know when cookies are done." Think about what consumers in your category may want help with and what problems may pop up. Then you’ll know what kind of snackable content you can create—on YouTube, your website, or elsewhere—that will solve a need. Brands that meet Canadians in their I-want-to-do moments can get chosen, and they may even be the heroes for ambitious young bakers like me. The other day I woke up and realized it was my anniversary with my fiancé—that day. While still bleary-eyed, I did a search for running shoes I know he's had his eye on. I quickly found a store that had the right size and brand and stopped by on my way to work to pick them up. Crisis averted! People may not always have a plan for which coffee shop or hardware store they want to go to. When a craving or a need hits, they pull out their smartphones and find a convenient spot that makes sense. 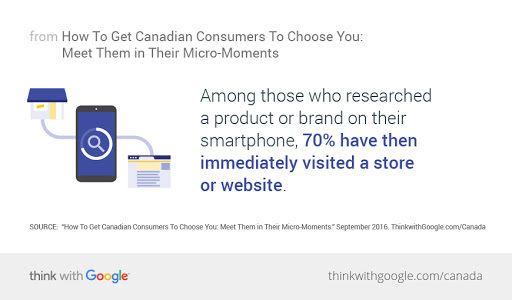 Canadian brands can win I-want-to-go moments by meeting consumers' needs in key moments. Whether it's providing a way for consumers to call, showing local availability of products, displaying nearby locations, or providing clear and easy-to-understand address and business information, find ways to help potential customers find you. Remember that convenience often matters more than brand loyalty when someone is on the go, so make it easy for customers to find useful information. And when you prove consistently convenient, you can be the brand they choose over and over again. I-want-to-buy moments can occur at the end of a long path to purchase after consumers have weighed every option, read every review, and come to a decision. They can also happen in a flash, like when my fiancé realized he needed an air mattress before heading on his boys' weekend the next day (okay, it was a bachelor party), or when he looked in the mirror and decided it was time to book that hair appointment—right away. 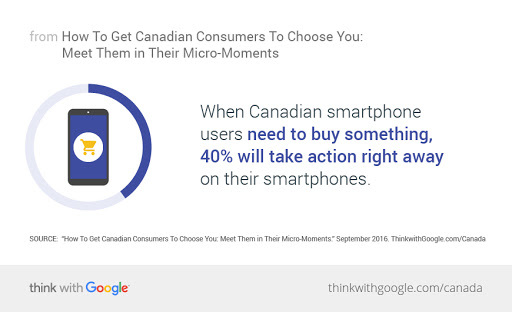 When Canadian smartphone users need to buy something, 40% will take action right away on their smartphones.1 In those moments, it's crucial for brands to be there and to provide quick, frictionless experiences. These moments are perhaps the most important for brands because consumers often haven't made their minds up yet. When my fiancé needed a haircut, we hadn't lived in Toronto that long, so he was totally open on location and brand. These kinds of moments are prime opportunities for brands to be present, give helpful information, and get chosen. When it's all up for grabs, it's no wonder these moments of intent are the new battleground for Canadian brands. When people are looking to buy, your brand can influence their decisions and preferences by being there with the right information and providing a seamless experience for them to get the products and services they need. Even better, if your brand has built up goodwill over the course of consumers' paths to purchase in all the moments that matter, you're more likely to win the day. 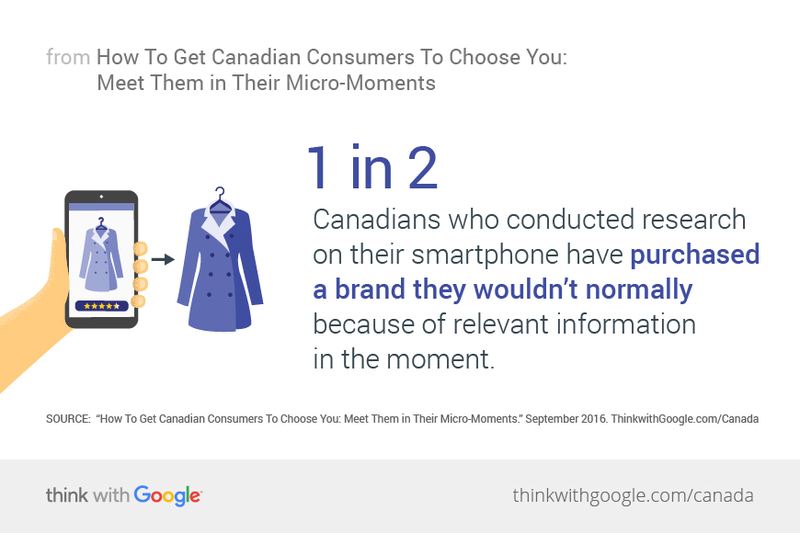 All across Canada, consumers are pulling out their phones in billions of intent-rich micro-moments every day. In these moments, consumers want what they want, when they want it—and they're drawn to brands that deliver on their needs. Identifying what types of moments are happening in your category can help you not only respond to consumers in moments of need, but also give them opportunities to discover, engage, and connect with your brand. When you provide consumers what they need, you may find that you won't need to interrupt their experiences—they will choose you. 1 Google/Ipsos, "Moments That Matter Research North America," April 2016, Canada, n=821. Base=smartphone users. 2 Google/Ipsos, "Moments That Matter Research North America," April 2016, Canada, n=622. Base=conducted research on their smartphone. 3 Google/Ipsos, "Moments That Matter Research North America," April 2016, Canada, n=1001. Base=online consumers.